Masonry support systems are used to reinforce the external leaf of masonry wall clad buildings with a bracket angle support. They are designed to provide a horizontal ledge to take the weight of the masonry wall panels above. They are also often referred to as a Brickwork Support System or Steel Bracket Angle. The steel angles are fixed back to the structural frame by various masonry restraints depending on whether it is a steel frame or concrete frame. There are 4 main types of masonry system these are; Continuous angle, welded steel bracket angle, individual bracket angle support and off the shelf system. All masonry support systems are generally manufactured out of grade 304 stainless steel. This basic masonry support system consists of a length of continuous angle that is fixed directly back to the masonry's structural frame. This simple effective angle bracket system is not suitable for larger brickwork masonry cavities. This masonry support system is similar to the continuous angle but it has individual brackets welded onto it at the designed centres depending on the loading. These brackets are then fixed back to the brickwork structural frame. This masonry support system is the most economical for wider cavities and, as the bracket angle is designed not to span the full width of the cavity, it offers a lightweight option. 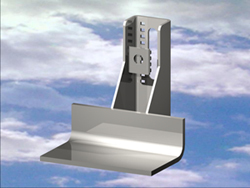 The individual bracket system is generally used around curved masonry panels, it consists of a single bracket welded to a length of horizontal angle stainless steel. This system consists of various size stainless angle brackets, again depending on the loading being fixed back to the structural frame at the system centres. The horizontal angle is then loaded into the brackets, adjusted and locked in place. This type of system is designed for speed of design and delivery as it is a stock item for suppliers. 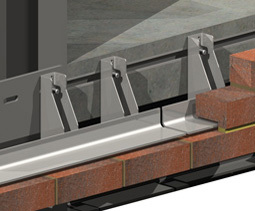 The welded systems do not allow for onsite adjustments or accommodate variation in cavities and loads, this is why this option of masonry support is commonly used. Generally bricklayers fix masonry support as the brickwork progresses, this not only stops the bricklayer laying bricks but as they are not structural engineers can result in various problems. It is fairly common that some masonry angle brackets are not tightened up, or not fitted at all. It is also common to find the incorrect size / specified bolt being installed which in turn can result in the brickwork panel dropping and cracking which will inevitably result in the wall having to be rebuilt. Vision installers are trained and experienced in the fitting of masonry support systems, we offer time served operatives that are able to overcome any masonry or brickwork fitting issues. As with any tradesman the longer you do something the quicker and better you get at it. Our teams will fit up to 60 metres of masonry angle per day depending on the specified fixing. This not only allows bricklayers to be more productive but also speeds up tight site programmes which is essential in modern day construction. 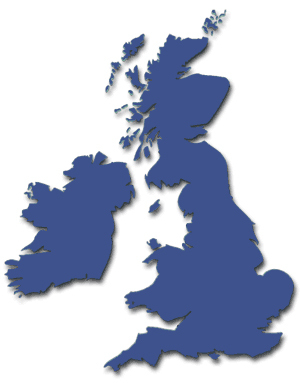 With Vision fitting you are guaranteed that it is fitted to specification with the correct fixings and fixing centres. All fixing bolts are tightened to the specified torque settings. We will also ensure that your brickwork system is fitted with the correct shims where necessary. By using Vision, more metreage will be fitted on a daily basis. A QA sign off sheet for each elevation fitted will be provided daily which gives you a holding point with clerk of the works. Your support system will be fitted once fitted right. We have found Vision to be well equipped for all aspects of the services they provide. They overcome on site problems with efficiency and interact well with our site teams. We have no reservations in recommending them. Click on the links below to view a case study. See just how much time and money you can save by using Vision Installers!